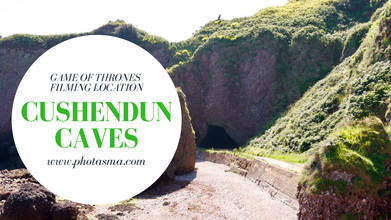 The fascinating Cushendun Caves of County Antrim in Nothern Ireland were formed over 400 million years and not only offer unique photo ops and beautiful hiking, but have also claimed a bit of attention due to their serving as the 'Stormlands' in Season 2 of HBO's Game of Thrones. The priestess Melisandre is escorted here by Davos Seaworth (at the behest of Stannis Baratheon), only to give birth shortly thereafter to a ominous shadow figure. Description: Cushendun Caves is located in Cushendun, Northern Ireland. The cave site was used in the filming of Game of Thrones only once, but the results of this scene were far reaching. The caves were used as a location near Storm's End in the Stormlands in season two. Stannis Baratheon could not convince his brother Renly to accept him as the true King, so Stannis ordered Davos Seaworth to smuggle the witch Melisandre to a cove near Renly's camp. In the cave featured in this video Davos watched Melisandre give birth the shadow creature that ended up killing Renly. This video is mainly drone video showcasing the caves and the surrounding area. After visiting this location I can see why this site was selected for filming this scene. The town of Cushendun nearby is a beautifully quaint little town with a goat mascot on the side of the road. This is definitely worth a stop if you are in Northern Ireland. Please like this video if you enjoyed it!